It was my birthday and I wanted a treat, and seeing as two quite interesting exhibitions were on in London, it seemed as good an excuse as any to wend my way temporarily down south. 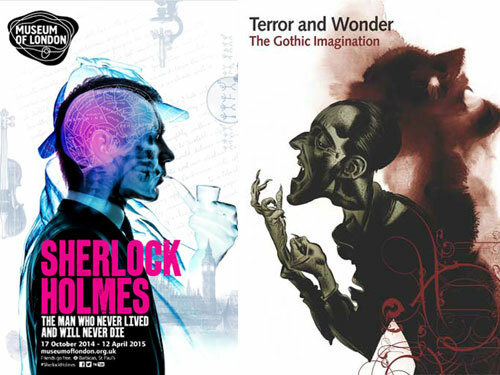 I decided to see Terror & Wonder: The Gothic Imagination at the British Library (open until 20th January 2015), and Sherlock Holmes: The Man Who Never Lived And Will Never Die at the Museum of London (open until 12th April 2015). I’d never been to either place, so that was a bonus…. I do like a bit of Gothic – I loved vampires and witches when I was a child, and I really enjoyed the Gothic element to my English degree course when we covered the Romantic period. It was great to see so many first or early editions of Gothic novels, and it was quite funny seeing the seven Gothic novels mentioned by Catherine Morland in Jane Austen’s blistering satire Northanger Abbey. What I liked best were the number of manuscripts on show, such as Charlotte Bronte’s Jane Eyre, Mary Shelley’s Frankenstein, Wilkie Collins’ Basil (including some delightful doodles by the author), William Wordsworth’s “The Vale of Esthwaite”, M. R. James’ “Casting the Runes”. And then letters – John Polidori, author of The Vampyre (where he crossed the myth of yore with his employer Byron, thus creating the decadent aristocratic version of vampires which has passed into the public imagination), writing home to his family whilst on his travels with Byron; a letter from Byron himself to his publisher, bemoaning old-stick-in-the-mud Southey for assuming that “improper conduct” had been occurring at Villa Diodati. The exhibition starts with Horace Walpole and Strawberry Hill House, and his Gothic novel, The Castle of Otranto – the first of its kind.1)I’m glad I watched some of the BBC series which accompanied this exhibition – well, as much as I could see of it before iPlayer threw a wobbler and went into endless-buffering-meltdown. As interesting as this all was, I did feel as if a rather large proportion of the exhibition had been given over to him, although the inclusion of poor, doomed Thomas Chatterton’s Mediaeval forgeries was fascinating. “But why do people think this is fake? Pouring old tea leaves all over this paper makes it look so realistic!” Erm… no, Thomas…. 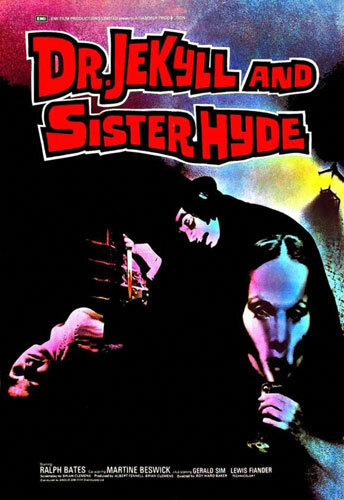 Aside from the first editions and manuscripts, there were posters for Gothic plays of the Victorian period, and then onwards into Hammer Horror territory (the set designs for 1974’s Frankenstein & The Monster from Hell were fab, and a bit later in the exhibition were some film posters including one of my favourites – Dr. Jekyll and Sister Hyde!). The exploration of Victorian Gothic – how it went from the haunted castles of the past to the dirt and grime of the mysterious city, was fascinating, which of course leads you into Charles Dickens territory, along with penny dreadfuls, onwards to the Sensation Novels.2)Which is how you can see Sherlock Holmes as a Gothic hero of sorts, because he navigates the Gothic Victorian city and makes the mysterious knowable. The order in which the artefacts were displayed was quite ingenious in parts – for instance, they led on from Dr. Jekyll and Mr. Hyde to a stage production of it in 1888 starring Richard Mansfield. His portrayal so terrified audiences that his acting skills alone had him down, for some, as a suspect in the Whitechapel murders. And so to follow on – a copy of the infamous Illustrated Police News, reporting in garish graphics the murder of Annie Chapman, and then – the Jack the Ripper “Dear Boss” letter. The “Dear Boss” letter alone was worth the price of admission, although to actually find myself separated from this hideous red-ink scrawl by just a thin pane of glass was genuinely horrifying. I felt so disturbed by coming so close to it that I went off in a daze – such is the power of the dual repulsion/attraction of horror, and I somehow managed to miss the vampire part of the exhibition! Curse you, Jack the Ripper!3)Or whoever wrote it if it wasn’t him…. 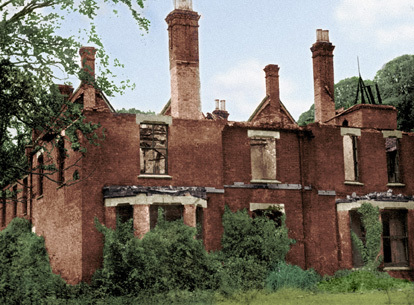 There was a brief section on Borley Rectory and the fiction it has inspired – I didn’t realise that it had influenced Sarah Waters’ fantastic novel The Little Stranger, but there you go. They also had Harry Price’s 1937 instruction manual for investigators at Borley, published by the University of London Council for Psychical Investigation. I was a bit confused as to why there was a prop from The Shining in the exhibition (it seemed to be a bit on its own – there weren’t any other horror film props lurking, as far as I could see). By this point I’d been in the exhibition for an hour and a half and was wondering if I’d ever see daylight again. It culminated in a room of photos showing goths in their natural habitat – the Whitby Goth Weekender – and in the middle of the room were two gowns: a white Empire-line gown from the 1810s (to show what a Gothic heroine would wear) and a black and purple Edwardian gown (which I thought, before I’d looked at it properly, was in fact a 1970s or 1980s Goth stage outfit! Siouxsie Sioux would look lovely in it, anyway). I wasn’t quite sure how well this room worked – I suppose to contrast the historical costume with what goths wear now, but I did wonder why some credit couldn’t be given to the cultural productions of Goths themselves, rather than them being a subculture who are photographed by slightly-sneery anthropologists. Well, there were some fanzines, so a brief nod was given at least. After a pitstop for lunch in Soho (where we saw Brett Anderson from popular 90s beat combo Suede go into a barber’s to have his hair done – I am absolutely not joking), we wended our way towards St. Paul’s, to the Museum of London. We popped into the church of St. Botolph’s-without-Aldersgate too, which is mere centimetres away, but that’s for another blog another time. I suppose the time is right for a Sherlock Holmes exhibition, and the Museum of London have put a lot of effort into promoting it. As you approach their 1960s brutalist structure (it seemed to me to be in the middle of a roundabout), you could see the ‘dancing men’ device from “The Adventure of the Dancing Men” in large plastic figures around its walls, and then once you’d gone up an escalator and across a walkway (what strange architecture this is! ), the approach to the museum has a giant text from that story around the inner walls. Quite ingenious. The exhibition was quite cleverly laid out to start with, so that you disappeared behind a revolving bookcase door into a corridor lined with fake book shelves. The walls were studded with screens showing various film and TV incarnations of The Man Who Never Lived And Will Never Die,4)Bet the makers of the James Bond films wished they’d come up with that for a title…. with some rather splendid film posters from around the world (Holmes and Watson are nothing if not well-travelled) and then you were into the exhibition itself. The first part of the exhibition looked at Conan Doyle – his manuscripts and early editions, including rare copies of Beeton’s Christmas Annual which ran the first Holmes story, “A Study in Scarlet”. There were also some of Sidney Paget’s illustrations – I absolutely love them anyway, so to see them up close was great.5)What you may not know, but becomes obvious once you spot it, is that the Jeremy Brett ITV Holmes episodes often used Paget’s pictures as starting points for setting up the scenes. Seeing stills from the series compared with Paget’s artwork is very illuminating – but this wasn’t covered here. I found myself interested mainly, once again, in the manuscripts. To see the early names of Holmes and Watson – Sherringford Holmes and Ormond Sacker – in Conan Doyle’s hand, was, perhaps a highlight for me. There was even the MS of Poe’s Murder in the Rue Morgue, considered by some to be the first detective novel. Holmes and Watson, bros just chillaxin’ at the Turkish baths. Of course. But after that good start, it sadly petered out, which was rather disappointing. It being the Museum of London, they focused very much on the London aspect of Holmes – and, quite frankly, why not, seeing as he’s forever linked (possibly thanks to Hollywood and Basil Rathbone) with foggy London streets and the distant, solemn clang of Big Ben. But it did seem a bit extraneous – “Here’s our collection of late Victorian paintings of London street scenes!” and “Here’s our collection of late Victorian photographs of London street scenes!” and “Here’s our collection of late Victorian postcards of London street scenes!” It rather smacked one as waffly filler. A bit would’ve been interesting, but I think there was too much – it might have been more accurate had the exhibition been billed as “Sherlock Holmes’ London”. I got the impression that some of the exhibits had been wheeled out partly to keep school children entertained – “Sherlock Holmes used disguises. Here’s a 1930s theatrical make-up kit.” Why was that deemed necessary? Ok, it was interesting to see a 1930s theatrical make-up kit (I could even smell the grease paint through the admittedly very nice Victorian-style cabinets that some of the exhibits were kept in), but it did seem to be stretching the relevance somewhat. Someone clearly had a marvellous time rummaging about in the MoL’s stores, and they dug out all sorts of late Victorian/early 20th century artefacts, and whilst the early telephones were certainly very nice, and the 1880s phrenology lantern slides from Pentonville Prison were eye-opening, was it really all that relevant to Sherlock Holmes?6)Not to mention: Victorian spectacles (Conan Doyle trained as an occulist), hats, pipes, a medicine chest containing opium, typewriters, an 1874 “Psycho” automaton, a photograph of Sarah Bernhardt, who might have been the model for Irene Adler, etc etc – all very nice in a museum-y sort of way, but they’re only connected with Sherlock Holmes because of the period in which they were manufactured and the fact that the Museum of London shoved it all together in a room and stuck “Sherlock Holmes” on it! I wish I didn’t feel so mean in pointing this out, but…. 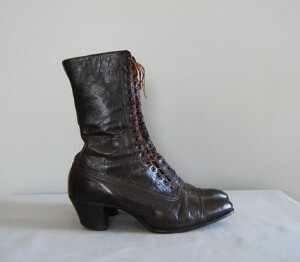 A photo of some old boots. Not ones from the exhibition… just some old boots, basically. They got the chance to show off their collection of late 19th/early 20th century shoes, and at the same time gave the visitor a crash-course in shoe-print recognition (I should probably admit – or not – that when it snows, I have lots of fun by choosing a pair of shoe-prints and seeing how far I can follow them before they get lost in the slush. I have a feeling that this might be deemed a rather peculiar hobby by some…), and what I really liked was the cabinet about Francis Galton and early fingerprint-testing; fascinating to see, and to understand how it revolutionised crime detection. There were several screens running clips of various films and TV series around the exhibition; it was nice to see how Brett, Rathbone and Cumberbatch compare (although I felt this aspect could’ve been explored in more depth – bear in mind Sherlock Holmes has been played by more actors than any other character. Maybe a whole exhibition could be given over to “Holmes on screen”. 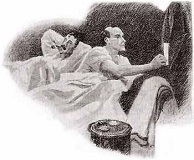 Part of the reason Sherlock Holmes “will never die” is because he is constantly recycled on screen and has entered the land of myth and archetype). I was surprised by the lack of props and costumes, although I did get to see Benedict Cumberbatch-as-Holmes’ overcoat (“The Milford Coat”, designed for him by Belstaff, the lucky sod) and his dressing gown (but sadly not his socks or hot water bottle), as well as “the wall of rats” (a collage of suspect photos, notes and maps) from “The Empty Hearse” episode of Sherlock, so all was not lost.7)Then again, imagine if there had been a wall of “that kind” of fan art. Eeeek! However, the fandom around Holmes might’ve been interesting to look at. It wasn’t. I do think this exhibition could’ve been improved had there been more things on display that were actually connected with Sherlock Holmes – but I suspect a great deal of things are in private hands, forever lost to the public gaze. Wither Rathy’s deerstalkers? Jeremy Brett’s top hats and canes? Robert Hardy’s monogrammed slippers? 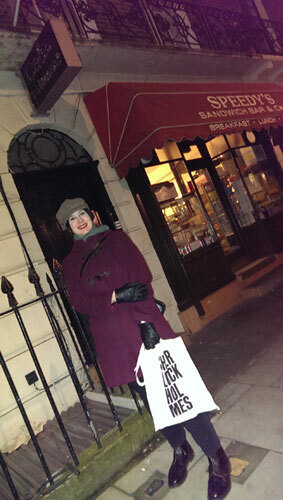 Yes, I worked out where the frontage is for “Baker Street” on BBC Sherlock. The knocker on the front door is wonky in real life, and yes, it’s quite annoying. So I did have a nice birthday treat in the end, and walked vast distances in my new Solovair brogue Derby boots (so I can pretend to be a Victorian detective, but with a nice solid sole) without getting blisters. I liked seeing these places I’d never visited before – as a librarian, I’ve only ever been to the British Library Document Supply Centre up in Yorkshire (a decommissioned ordnance factory, no less, and extremely unglamorous compared to St. Pancras’ shiny younger sibling, although its post-sortation machine is the most diesel-punk thing I’ve ever seen), so I was quite excited about the London British Library, but alas, had no time to linger. I’m glad I went to the Museum of London, even though the Sherlock Holmes exhibition (and the Gothic exhibition to an extent) was a bit uneven. I suppose it’s both a plus-point and a failing of both exhibitions that they were showing what their own collections have their strengths in – old books and MS’s in the case of the British Library, and vast quantities of London-centric ephemera in the case of the Museum of London. The Museum of London currently has a Paddington Bear display (a display, not an exhibition! 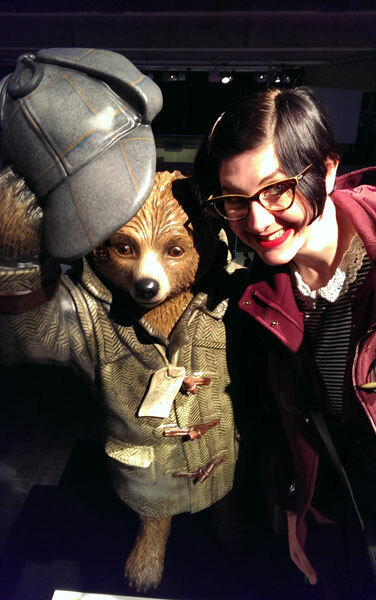 ), so I saw a real Paddington from the 1970s tv series! And also Benedict Cumberbatch’s Paddington, which was basically Paddington dressed as Sherlock Holmes in herringbone tweed (I didn’t see that one coming… noooo, not at all). 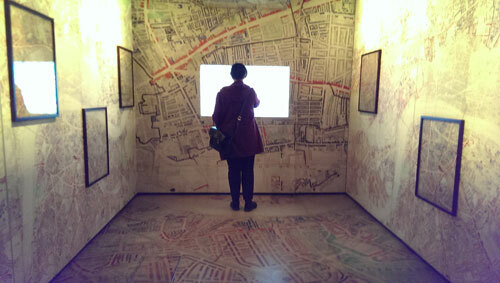 Their history of London exhibition was rather fascinating (Victorian wax models of diseased body parts – I liked those more than I should), and I spent a lot of time in the interactive map room, gliding virtually through Charles Booth’s poverty maps. Also, the Museum of London has a nice café, and not only that, but the Lord Mayor’s coach! (I have found an Elizabethan Lord Mayor of London in the Cardinall family tree, so this took on extra relevance for me). They have the biggest Suffragette collection in the country, but by this point, I was absolutely exhibitioned-out: my brain couldn’t absorb any more information and all I wanted to do was fling myself into my train carriage and drown myself in a flask of tea. So my green-and-purple ladies will have to wait for another time…. Sherlock has a Mind Palace – I had fun in this amazing Map Palace. 1. ↑ I’m glad I watched some of the BBC series which accompanied this exhibition – well, as much as I could see of it before iPlayer threw a wobbler and went into endless-buffering-meltdown. 2. 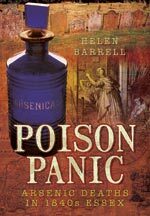 ↑ Which is how you can see Sherlock Holmes as a Gothic hero of sorts, because he navigates the Gothic Victorian city and makes the mysterious knowable. 3. ↑ Or whoever wrote it if it wasn’t him…. 4. ↑ Bet the makers of the James Bond films wished they’d come up with that for a title…. 5. ↑ What you may not know, but becomes obvious once you spot it, is that the Jeremy Brett ITV Holmes episodes often used Paget’s pictures as starting points for setting up the scenes. Seeing stills from the series compared with Paget’s artwork is very illuminating – but this wasn’t covered here. 6. ↑ Not to mention: Victorian spectacles (Conan Doyle trained as an occulist), hats, pipes, a medicine chest containing opium, typewriters, an 1874 “Psycho” automaton, a photograph of Sarah Bernhardt, who might have been the model for Irene Adler, etc etc – all very nice in a museum-y sort of way, but they’re only connected with Sherlock Holmes because of the period in which they were manufactured and the fact that the Museum of London shoved it all together in a room and stuck “Sherlock Holmes” on it! I wish I didn’t feel so mean in pointing this out, but…. 7. ↑ Then again, imagine if there had been a wall of “that kind” of fan art. Eeeek! However, the fandom around Holmes might’ve been interesting to look at. It wasn’t.